If you’re the type who likes a good cry, and you’re looking to be inspired in a meaningful way, this new book, available in select stores before Shavuos and online, is the perfect book for you. 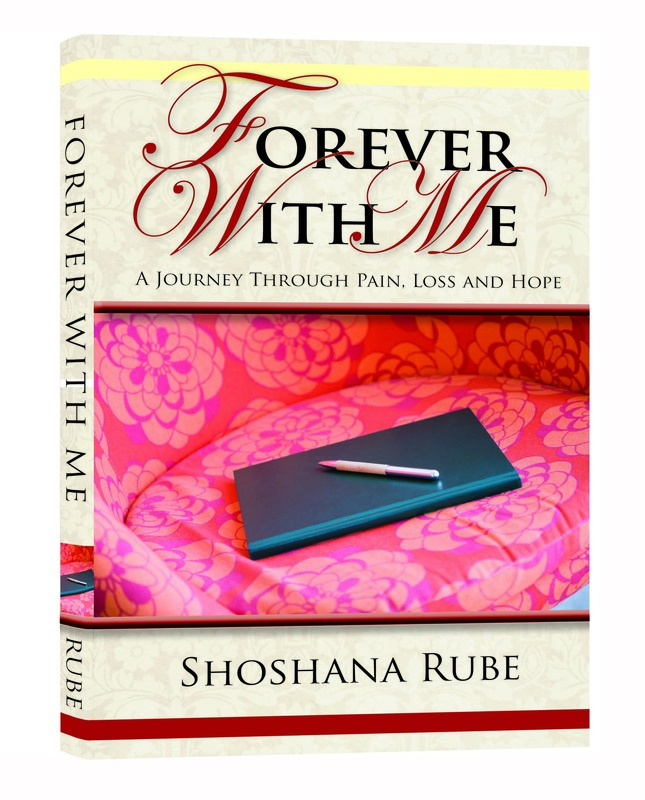 Forever with Me, by Shoshana Rube, is a moving memoir depicting the searing pain of a teenager who watches her mother suffer from a terminal illness and eventually succumb to it. In her honest account, the author shares personal letters written lovingly to her mother as disease swept across her mother’s body, as well as the letters she wrote even after her mother’s untimely passing. Through the letters, we watch a young girl struggle with pain, yet find strength for the future and emerge from the heartbreak in a hopeful and optimistic frame of mind. This is a book that will bring you to tears, yet will uplift and inspire you at the same time. I sit here alone in this hospital lounge room. Panic and devastation has overtaken me. I can feel my body shaking from the grim news and I feel as though my life is over. I want to join you in your hospital room and hold your hand and hug you tight and cry on you, but I can’t. Daddy is afraid that the news would be emotionally too difficult for you to deal with. Daddy sadly informed us that you have less than one week left. This can’t be! How can I, a 15 year old girl, bid a final farewell to you my dear mother? How can I function, knowing that in a few days, you will be but a memory? Mommy, I can’t believe that this is really happening. In just a matter of time, you will be gone forever leaving us all alone. Is it possible that this is reality and not a nightmare? I am so torn now. I want to sit at your side and spend every moment that’s left with you. But it would be detrimental for you to see me crying like this. Daddy is right. How on earth, would you be able to cope knowing that your role as “wife and mother of six” is coming to a close in less than a week and that you’re leaving behind your precious children to fend for themselves? I know Hashem‘s ways are just. But what exactly does He have in mind right now? How can this be for our good? Perhaps I’m just being very negative now. Maybe Hashem will perform miracles for us. The doctors will be amazed. They will discover that the cancer that has stricken your body has miraculously disappeared … You will be completely cured … You will be discharged from the hospital … We will lead a normal family life once again … Help! I think I’m dreaming. However, when there’s life there’s still hope. So Mommy, let’s continue to daven. You’ve taught me how to daven. You set such an example. Your Tehillim was your companion. It never left your side. No matter what the circumstances were in your life you always turned to Hashem. I feel a magnetic force pulling me to you… O.K., I’m searching for the courage to enter your room. I’m wiping the tears that have cascaded down my cheeks. I don’t want to let you on, to what’s going on in your life – our life. As I approach your room, I can see that the door is closed. Daddy is probably sitting next to you. He really has a way of protecting you by hiding his emotions. Please Hashem. I beg of you. Give me strength. This is so painful. Mommy, I love you. I need you. I won’t go on without you. This entry was posted on Friday, May 14th, 2010 at 8:00 am and is filed under Book Excerpt, General, New Books. You can follow any responses to this entry through the RSS 2.0 feed. You can leave a response, or trackback from your own site.